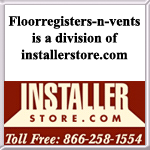 Imperial has a line of vent products you can choose from. They offer heavy duty return grilles, triangular/rectangular baseboards, plastic pop up registers and sidewall registers. They all come in a variety of sizes. Baseboard registers with plate damper for easy air flow control. Save with low flat rate shipping! This plastic air vent cover is your perfect solution to old, metal baseboard grilles. Use this open return vent in your bathroom or kitchen and breathe a little easier knowing this product won't rust. Our decoratively finished brass air vents will look wonderful in your home next to your other brass accents. Made out of steel, these air return covers will supply a continuous airflow in your home. Order now! Stylish and chic, this pewter metal baseboard vent can be yours for one low price. Install the decorative grill cover by mounting it to the wall with screws and you're done! This triangular baseboard return air grille has a shallow projection from the wall measure 2". Our white vent cover is installed by simply screwing the grille into the wall. Screws are provided. Durable brass vent covers have a plated finish which will lighten up any room. The faceplate on this return air grate will measure larger than the listed hole size to ensure it covers up ductwork. Plastic vent covers are the ultimate solution to stop rusting vents from attacking your ductwork. This classic cold air return can be used on the wall or the ceiling and will sit virtually flat once mounted. Install this metal grille easily by using the screws which are provided with your order. These return air vents can be used for both heating and cooling needs as they remain open to allow for proper air flow. These sidewall registers are made out of all steel and have a swinging plate damper in the back. Use these white vents in your commercial or residential locations. White Steel baseboard return with a smaller faceplate than standard baseboard grilles. Imperial baseboard return has an overall depth of 7/8 inch.